Howdy! Welcome to Dreamweaver Ranch. We are a small ranch located just south of Emo, Ontario, Canada in the heart of God's country. 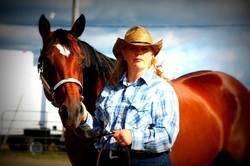 We offer a variety of services and interactions with horses including youth horse club, adult intro to horses, family day at the ranch, birthday parties, group farm visits, horseback riding lessons, horse/pony rides, miniature horse petting zoo, horse and ranch experience packages, and more. We specialize in beginners but can accommodate students at any level. Although we like to kick up our heels, we believe that good horsemanship starts with a good foundation and trust with the horses. Our mission is to share our passion and love for horses with students in a safe, controlled and enjoyable environment. Our website is being updated constantly. Please check back for more information and pictures soon! Thanks for stopping by!